Muhlenbergia schreberi J. F. Gmel. Also Called: Schreber's muhly, satin grass. Culms: Initially erect, later sprawling, usually rooting at lower nodes, slender, weak, solid, flattened, glabrous, openly branched; flowering branches 4-12 inches tall. Blades: Flat, 1 to 3.6 inches long, 1/12 to 1/6 inch wide, spreading or ascending, glabrous or minutely rough, usually sparsely hairy near collar, slightly narrowed towards base. Sheaths: Shorter than internodes, keeled, flattened, glabrous or rough, sometimes pubescent on margins at collar. Ligules: Membranous, very short, fringed. Inflorescences: Panicles, very slender, linear in outline, mostly terminal, 2 to 8 inches long, 1/16 to 1/5 inch wide, lax, loosely-flowered; base stalked, exserted or included in base of leaf sheath. 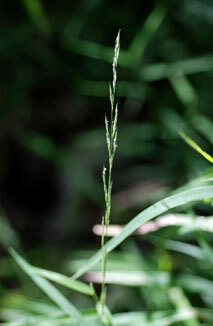 Spikelets: Narrow, flattened, lanceolate to oblong-ovate, excluding awn 1/12 to 1/10 inch long; stalk 1/25 to 1/12 inch long, rough; glumes minute, easily overlooked, without veins, less than 1/4 as long as lemma; tip rounded to bluntly pointed, awnless; lemmas lanceolate to narrowly ovate, 1/12 to 1/6 inch long (excluding awn), membranous, 3-nerved, rough, tuft of short hairs at base; tip sharply pointed; awn 1/2 to 1/5 inch long. Habitat: Moist woods and thickets, stream banks, roadsides, pastures, old fields; moist, disturbed shaded sites. Comments: Forms tufts or colonies. Somewhat weedy, particularly in lawns and gardens. Named for German botanist Johann Daniel Christian von Schreber, 1739-1810.